Huge win by the Colts tonight over the heavily favored Packers. While the teams were evenly matched in nearly every category, turnovers proved to be the difference maker. Andrew Luck was 11-12 with 225 yards passing, 1 TD and 1 INT. Aaron Rodgers was 18-25 with 217 yards passing, 2 TD’s and 3 INT. Leading rushers were Cedric Benson with 10 carries for 50 yards. The Colts were led by Larod Stephens-Howling with 11 carries for 47 yards. 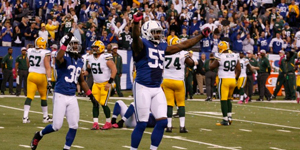 The game was sealed in the 4th quarter as the Packers were driving in Indy territory and James Farrior came up with a timely interception. This game brings the Colts back to .500 and sets a great tone after coming out of a bye week.